WILLS POINT, Texas, Feb. 5, 2019 /Christian Newswire/ -- GFA (Gospel for Asia, www.gfa.org) is mourning the loss of one of its field-partner workers, a pastor who has been reported dead after being abducted at gunpoint in Myanmar, formerly Burma. 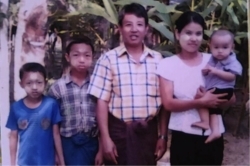 Photo: Tun N., a GFA-supported pastor that served in Myanmar's Rakhine State who was killed after being abducted Jan. 19, is pictured here recently with his wife and family. "We are heartbroken to learn of Pastor Tun's death, and we ask you to join us in praying for his wife and family, and his church at this time, that they may know God's comfort, peace and strength," said GFA Founder Dr. K.P. Yohannan. Married with three children, Pastor Tun led a congregation in Myanmar's Rakhine State. During 20 years as a pastor, he had shared the love of Christ with many and started several fellowships. "All of our brothers and sisters in the field know that, as Jesus said, they go out as 'sheep among wolves,'" said Yohannan. "Like Pastor Tun, they are willing to lay down their lives, if need be, to share God's great love with those who have not yet heard the good news." Pastor Tun's abduction and death is the first incident of its kind for GFA-supported ministry in Myanmar, which represents more than 500 congregations. The church has made a significant impact in this country. For updates, the public is encouraged to visit www.gfa.org.